This intensive programme enables young unemployed people to improve their skills, confidence and employment prospects, while leaving a legacy for others in similar situations. 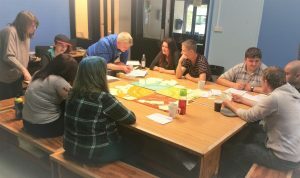 Supported by One Community, we are working with groups of young people in Kirklees who have been out of work for over a year to develop a toolkit for employers who want to help unemployed young people facing the toughest challenges to find work and stay employed. Our youth workers help long-term unemployed young people to co-produce tool-kits that helps employers support them, and others like them, into sustained employment. Young people are guided by youth workers in helping create solutions to employment barriers. The tool-kits help employers understand the issues faced by the long-term unemployed and will contain a variety of helpful methods, ideas, guidance and actions.